if it were not so, I would have told you." There are many heavenly planes of existence with different consciousnesses connected with the planet Earth. When leaving the Earth in so-called death, people go to the realm they have earned in life that is in alignment with their evolution. The plane just under God, the Absolute Unmanifest Essence from which all is created, is named the celestial realm, and therein dwell those whom we call Deities. Bhagavan Sri Skanda is of this celestial realm. This celestial plane, the highest of the heavens, is one of the mansions to which Jesus referred. Sri Skanda first came into my life many years ago while I was living in the Orient, in Ceylon, now known as Sri Lanka. Some friends arranged for me to visit Katragama, the place of His shrine and temple, situated deep in a jungle. At 4 a.m. on the day of my pilgrimage, I was awakened and abruptly sat up, remembering my upcoming trip. Being sleepy, however, I lay down again. "Immediately! Get up and come!" I jumped up. At that time I did not know it was Muruga, as Skanda is called in His youthful form. The route to Katragama requires travel through remote territories of Ceylon. I traveled through the jungle in a rickety bus, which stopped before entering the deep and dangerous part of the jungle. The driver asked everyone to get out of the bus to visit a small shrine and to break a coconut by dashing it on a stone before a temple. Passengers told me a European once had laughed at this ritual as he passed through this jungle in his car. Later on in his journey, he was hurt by a rogue elephant. I need not say that I broke the coconut quickly. The trip through the jungle was long and the bus crowded, but it was a new experience and interesting. My first trip through the jungle! I could see eyes shining, looking at us as we passed the undergrowth, and I spotted a wild elephant. A few miles from the shrine, the air itself began to change. It is almost impossible to describe the feeling of divine inspiration and excitement that comes over you as you approach this spiritual center. The air seems rarified. It is as if light enters you and changes the atoms of your body. Miles from the shrine, everyone starts to chant "Muruga, Muruga, Skanda, Skanda!" Joy fills the heart with expectation. The bus arrives and there, quietly flowing before your eyes, is the sacred Ganga, or river, with a small bridge passing over it. No cars or buses go beyond this point. You walk on foot over the bridge in ecstasy, momentarily stopping to look at the flowing water below, knowing that you are about to enter holy ground. No one needs to convince or convert you. The outside air becomes an extension of yourself. You become one with the holiness and feel it in every pore of your skin. Bathing in the ganga before going to the temple is part of the ritual of the shrine. The quietness of the softly flowing river and the green-leaved trees overhead makes you think, "This is what life is all about — bliss and peace." The words "Shanti, Shanti, Om" resonated in my head. I have only visited one other place on a pilgrimage where I have felt such keen expectancy and such a blissful feeling. That is at Lourdes, France, where you walk through fields of flowers to get to the shrine and where I felt an inner quietness identical to that of Katragama. "I tell you, take this water to your friend Selvaratna." I obeyed her and filled a jar with water from the spring. Later I arrived in Ceylon and was reluctant to give this holy water from Lourdes to my Hindu friend. I met him one day on the street, however, where he said to me, "I was at Katragama and saw your Mother on a beautiful jeweled throne in the jungle there." I did not comprehend this, for my earthly mother had passed away long before. He became impatient with my lack of understanding and said, "Your Mother, your Mother  you know, Mary." I then asked him, "Would you like some water from Mary's spring at Lourdes?" He answered with almost joy in his voice, "Of course!" He drank the water and never touched alcohol again. He was completely cured  the desire to drink left him, never to return. How beautifully unified are those of the heaven worlds! Here was an ardent Hindu at Katragama seeing a Christian image of Mary in Skanda's forest. "All of the higher realms are one," I thought. "They work in divine unison." After our arrival at Katragama, the group I was with decided to climb the four miles of steep jungle to the top of the mountain, where the head swami stayed in a tiny hut. The group was noisy and boisterous as it climbed upwards, and as I wanted to make this a spiritual pilgrimage, I loitered behind the others until they were far out of sound and sight. The way was rugged, rocky and straight up, with a meager path to follow, and one could easily get lost on the mountain where wild animals, even tigers, roamed. As soon as I was alone, a stray dog (or so I thought) came up and walked beside me. When I walked, he led the way. When I sat and rested, he sat and rested. I became very aware of this as it kept reoccurring and continued until near the top of the mountain, where I rejoined my group. The dog disappeared into thin air and was never seen again. I told the group, experienced in the lore of Skanda, of this event and they looked at me in amazement and said,"Legend says Sri Skanda lets no one walk the jungle alone. He creates an aspect of Himself in the form of a dog to take care of the wayfarer." I was beginning to get attuned to the legends of Skanda. On entering the sacred temple, or dewale, I thought,"Is all this real? Is it true? If so, Skanda, may I have some sign?" Immediately a butterfly of enormous size and beauty flew through the temple door and came to me, and then went to a picture of Skanda and landed on it, moving its wings in rhythm with the temple drums. Then the butterfly disappeared. My faith grew stronger. On the mountaintop above Katragama, the view overlooking thousands of acres of wildlife sanctuary was breathtaking. Sometimes I would sleep there and join in the pujas held on the edge of the mountain. One or two of us staying atop the mountain would gather and join the swami for the 4 a.m. ceremony in which he would bless the world in Skanda's name. The priest would wind a cloth dipped in coconut oil atop a large stick and light it to make a great flare. We would stand there in the dark with the swami chanting, the pungent smell of the burning oil filling the air. The soft but crisp night air would wake us up as we watched him turn to the east, the north, the south and the west, waving the flare held high. Afterwards I would sit on the mountaintop and meditate until dawn. While sitting with eyes closed one early morning after a mountain puja, with the lingering smell of the burning oil from the flare still in the air, Skanda appeared to me for the first time in His grown-up princely form. Until then He had always appeared in the form of Muruga, the ever-youthful one. It is hard to describe the beauty of the Celestial Ones in this world of worries, fears and decay. Skanda appeared standing majestic, calm and quiet. His face, wondrous in appearance, emanated beauty, with love and power harmonized. Skanda's crown of gold, in the shape of a helmet, rose to a peak, denoting the awakened seventh chakra at the top of the head. The crown was dazzling with rare gems. He sent forth a light from these stones that filled me with an unearthly bliss. As Skanda stood in front of me in His ethereal form, He extended His hand and gave me His vel (pronounced vail), or lance. Being young and impudent and not yet knowing proper protocol, instead of bowing and saying, "Thank you, Skanda," I said,"This is fine, but it is only a vision. Where is the vel?" I soon climbed down the mountain and went to the temple to show my appreciation to Skanda for His blessing. In Katragama, devotees offer baskets of fruit and flowers at the shrine to the officiating priest, who takes them behind a closed curtain for blessing. Once blessed, the fruit is cut into pieces and returned. I sent in my offering, which the priest took to the inner sanctum. When the basket was returned to me, upon it was placed a pure silver shining vel. Skanda had heard me! He had performed the miraculous and had fulfilled the vision! Out from that ancient temple, so old that no one knows its age, I walked as if on air above the earth, ecstatic with love. It is the tradition of this temple that when the high priest passes on, a vote is taken to determine a successor for this lifetime position. During my stay in Ceylon, this changeover of priests occurred, and an acquaintance of mine decided to apply for the honored position. At first he was not sure whether he should apply — to become a high priest, one must pass many esoteric tests. While driving his car through the jungle to get to Katragama, my friend was still trying to make up his mind and wondered whether Sri Skanda approved of his intention. Suddenly, in the middle of the forest and blocking the road, there stood a peacock, the peacock being closely associated with Sri Skanda. He felt this was a sign from Sri Skanda and proceeded to try for the position. The last of many difficult tests to become high priest is to go alone into the powerful innermost sanctum of Skanda's temple. Though he was not allowed to tell me what happened, for he had taken the vow of silence concerning the initiation, when he came out, he was completely bathed in perspiration as if dipped in the waters of the ganga. He said that he would never be the same again. The priests who would make the final decision, seeing this and other signs, told him he had been chosen as the next high priest. The Skanda temple has no statue of any deity in it. It is small, and the inside seemed to me to be black with the soot of the ageless burning of camphor and oil contained in the tall brass lamps. The temple has no elegant carvings as in other Hindu shrines. Some who have their prayers answered give brightly painted canvas curtains with pictures depicting Skanda in various forms. These curtains, placed one on top of the other, cover the front of a high platform behind which only the priests may enter. The curtains are never raised and separate the worshipers from the holy sanctum. Instead of worshiping Skanda as an image or form, there is only a sacred casket containing a yantra, or mystical inscription on a golden tablet in which the divine power and grace reside. The casket containing the yantra is kept in the innermost sanctum, which only the high priest is allowed to enter. It is this casket which is carried on the back of an elephant decorated in splendor in processions at the great festivals of July and November. The elephant walks around the temple three times to enable devotees to feel close to this powerful, holy yantra. I was allowed once to walk in this ceremony right behind the elephant. Every time the procession stopped at certain designated places, the elephant turned and looked at me. I was nervous that he did not approve of this white-faced stranger from the West. One day, the holy man at the top of the mountain at Katragama told me to do a certain ritual for Murugan, the name by which he called Skanda. I climbed down the mountain and went to the ganga, bathed and put on a white sari. My friends brought me the object that looks like a rope doughnut and is used on the head to carry heavy water jugs. They put it on the top of my head, and on it they placed a chattie, or clay bowl, filled with burning hot coals. In my hand they placed a palm branch. I went along with all this because I wanted to experience and understand this strange shrine, so different from all the others that I had visited. Furthermore, if it was a step toward God-realization, I was willing to try. They told me to circle the temple grounds three times, a total of nearly three miles, with the chattie filled with hot coals balanced on my head. I felt so pure and calm as I walked, chanting "Skanda, Skanda." A light had entered me and I felt translucent. I was not conscious of the hot noon sun, nor afraid of the burning coals on my head. Two-thirds of the way around, however, I lost concentration and before I knew it, the chattie and coals had fallen off my head and smashed to the ground. I felt disconcerted over not completing the ceremony, and the feeling of failure stayed within my heart. Months passed, and I found myself in the city of Colombo, Ceylon. I was visiting a friend, an ardent Christian and devotee of Mary, who was going through a great deal of trouble. She asked if I would accompany her to a place her servants had begged her to go to for advice, where a famous psychic had a shrine dedicated to Skanda. We arrived ahead of time and sat in the garden with dozens of others who had also come to see him. A car drove up and a man in a western suit and tie got out. Walking straight to me and passing all the others, he stood with hands on hips and said to me with a loud voice, "I know you. Your whole life has been one of sacrifice. I saw you drop the chattie at Katragama and it made me laugh." I was taken aback at this audacious man standing in front of me and wondered why he spoke to me of this. Others around me, however, started getting excited and told me that the man was the psychic in trance, and that the Lord Sri Skanda was speaking through him. I was relieved Skanda laughed at the chattie falling. I then knew I had not failed Him. Katragama is also the famous site for fire-walking. A deep trench is dug, 50 feet long and 4 feet wide, where logs burn for hours until they turn to hot coals with flames shooting out from them. Those who have taken a dedicated vow to Sri Skanda to walk these coals must get permission from the head priest first and for ten days stay at Katragama, eating only vegetarian food and cleansing themselves as preparation. Once a Ceylonese friend of mine arrived at Katragama the day before to see the fire-walking. When she got there, a keen urge came over her to walk the coals. She went to the top of the mountain and the swami there said, even before she could ask, "I give my permission for you to walk the fire. Bathe in the ganga, fast for the day, and walk the fire without fear, in love." After the bathing ritual, she sat waiting by the river. Someone put a palm branch in one of her hands and a coconut in the other, and she entered the line with those who had been preparing themselves for days to fulfill their vows by walking the fire. When her turn came to walk, instead of seeing the long path of hot coals, all she could see was a bright red carpet and at the end Sri Skanda in all his glory beckoning her to come. She fearlessly danced down the bed of coals, and even though her sari was trailing in the fire, it did not burn or even get singed. A Westerner, arrogantly wanting to prove that fire-walking was only mind over matter and that Skanda was a fabrication of the imagination, said he would walk. He ended up in the hospital with terrible burns on the feet and legs and was bedridden for weeks. Living in the Orient was at times very difficult for me. Once I was praying ardently for help. I was living at the end of a lane in a small house with no furniture in it and few possessions. On one side were fisher-folk whom I often befriended when they were in need. Next door on the other side was a Catholic church, and sometimes the Catholic priest would visit me. One morning after I had been praying hard for help, the boy who cooked for me came about 6 a.m. and said, "There is a priest at the door." I asked, "What is he doing here so early?" thinking it was the Catholic priest. On going to the door, I saw a holy man from Katragama standing there. He was tall, serene and majestic-looking, holding long peacock feathers. Through both his cheeks was skewered a long piece of metal, showing Skanda's power over flesh. It went in one cheek and out the other, with no sign of blood. Often I have seen this, yet there is never a scar or sign of blood upon removal. I was so excited to see this being from Skanda's shrine that I practically dragged him in, asking him to sit down. He motioned me to come close and took from his bag an iron statue: "Take this and hold it at the top of your bed for five minutes and then return it to me." I did as he requested. When I returned the statue to him, he stood up without a word and left. He walked up the lane, went to no other houses, and was seen no more. Things went well from then on. Skanda knew my needs. I felt later that it was He in another form. 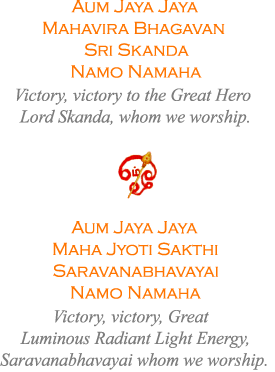 For many years, Skanda made me aware of His presence when the word "Skanda!" would burst from my lips of its own volition. While standing in front of Sri Sathya Sai Baba at his ashram in India, without prompting I spoke the name "Skanda!" Sai Baba looked intently at me and asked, "What did you say?" I repeated the name, and he turned to everyone around us and said, "She calls Him by His correct name, 'Skanda.'" Sri Skanda requested that I not speak of Him for one year after returning to America from my eighteen-year stay in India. Later He came and gave me instructions to hold a monthly ceremony, or puja, at the Hindu Temple in Queens, New York. Those in charge of the temple graciously agreed and gave permission to offer the Skanda-Jyoti puja, which since 1982 has been held around the time of the full moon and is open to people of all religions. Sri Skanda also gave to me detailed instructions for the Skanda-Jyoti puja ceremony. After the actual services are completed by a Hindu priest, each of the following two mantras are repeated thirty-two times. In His instructions, Skanda explained that these mantras, when said with devotion, harmonize the Siva-Sakthi, or yin-yang, energy within each person. "is symbolic of the spine, at the top of which is the head, inside of which flows Jyoti-Light, or the arisen kundalini." To emphasize His instruction, He showed the light within the vel. "In Jyoti-Light there is Equilibrium, Bliss and Grace. Those who want God-realization must begin at the bottom of the spine, at the coccyx. I am the Strength and Force who guides the kundalini from the bottom to the top of the spine." Skanda then showed Himself guiding the kundalini straight up, His hands around the spine. When the kundalini rose and finally burst forth, the Goddess Jyoti appeared. "First see Jyoti as a face in the vel,"
"then the whole Goddess explodes as the power rises, and She will stand in Her glory. Bliss is felt, and all aspirants who are in attunement with Her will get grace. The blessing then overflows to the Earth, helping to raise the consciousness of humanity. All this happens within but is symbolized without as the vel of Skanda." "I am the leader, the General, who guides these forces up the spine. You who yearn for liberation, look to me, follow my words, and victory will be yours. Turn away from the orders of the general during the battle, and defeat is the result. When there is war, the army must listen to the general."